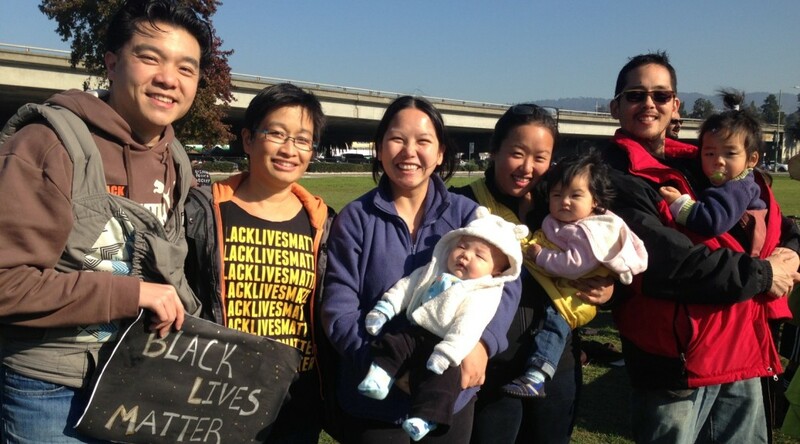 Photo Caption: At the Black Lives Matter Story Time: Family Teach-In and March in Oakland organized by the Colorful Mamas for the 99%. (From right to left) Tomu, Cliff Hong, Olivia, Marie Choi, Collin, Mychi Nguyen, Kimi Lee, and Alex T. Tom. I usually don’t share a lot of personal stuff on Facebook but lately as a new parent I’ve been leaning into it and sharing more, and at times, even ‘over-sharing’ my thoughts and reflections. Folks who know me well know that I like to give self-care/self-love advice and human/relationship development advice. Sometimes it’s unsolicited; but I believe it can still be helpful. I think all this is crucial for a strong and resilient movement and community. As we get into the New Year, I wanted to offer three practices that have helped me through the years as an activist, organizer, and Executive Director (and a good partner and father too!). We should all be reflective of what happened this past year — the ups and the down. We should take stock of what we appreciate and take time to detox from all the negative energy and toxicity. We are not immune to any of this since we (still) live in such an oppressive and unequal society. People — especially frontline organizers, service providers, healers, unity builders, movement builders take on a lot of society’s alienation, so need to take care of themselves while they are taking care of others. Every year, too, there is a lot of pain and loss; it is important to take this time to sit with things and remember the community we have that support and love us. #1 — Read (or re-read) “The Four Agreements” by Don Miguel Ruiz: This is by far the best and quickest read for me. It has helped me process and detox from the negativity around me. Negativity that comes in all forms. Whether it’s self-doubt, being too hard on yourself and others, processing the pain and trauma of others, or letting anger and outrage overpower our love and compassion, we are all living in the same movement ecology and impact each other. The Four Agreements are very practical and help me everyday. They remind me to be compassionate and kind to myself, and others, even to not so kind people in my life. #2 — Meet with yourself: This is my favorite. Movement builders have a lot of meetings and retreats to evaluate the year. Why don’t we develop a practice of scheduling 1-2 hour or day-long meetings with ourselves and do the same thing? Some people call it a “self retreat”. Every week, I try to set aside some time to meet with myself and do at least one self-retreat a year. If you decide to do weekly or monthly meetings with yourself, it should be a meeting you schedule well in advance that you don’t move or change unless an emergency comes up. Often times, since it is a meeting with yourself, you may feel like you can just reschedule to accommodate others. If people continue to ask what meeting you have that you can’t move, you can practice saying, “I have an important meeting with myself.” Of course, you should be flexible when needed; but if you have a pattern of always putting others before yourself, you can practice prioritizing meeting with yourself even if it is only an hour. #3 — Meet with your partner and/or other people: After you meet with yourself, meet with your partner (however you define it) and/or other close friends to share your reflections of the year, priorities for the next year, then get feedback. Self-care/self-love is about collective care and love. This is dialectic and should be done simultaneously. For partners/couples, it’s a good time to celebrate moments throughout the year and talk about stressors in the relationship and hard topics like tensions, shared finances, and long term planning, for example. They too should meet with themselves before this retreat. You get the idea. This year, I did my self-retreat for a few hours on New Year’s Eve. On New Year’s Day, Mychi, my partner, and I had a mini-brunch/retreat. This was actually our first “date” together, since we had our newborn, Collin, 3 months ago. We took pause and appreciated each other. We reviewed the year, which included looking at our calendars, pictures (mostly from our phones) and notes from our own reflections. In the midst of the challenging year, there were a lot of beautiful moments we forgot about besides having a beautiful child together. We also reflected that we are fortunate to have such an amazing community of chosen and non-chosen family and have deep gratitude for what we have in life. What happened this year? What are some highlights, themes and takeaways for the year? What triggers and stressors did we notice in ourselves? What did I change the most? What did I change the least? Where did I exercise the most and the least leadership? What are our personal and collective priorities for next year? What are practices we want to continue or develop? What kind of support do we need from each other? Thank you for taking the time to read this. I write this humbly and know there is no formula on how to do take care of ourselves. There are a lot of other resources and expertise, especially in the Bay Area, for self-care in the movement. These are just a few practices that have worked for me. Many of my practices actually comes from OGs in the movement that I met at a weeklong silent meditation retreat in my early 20s. They said I was too young to be so “burnt out” already. One woman in particular told me she scheduled important meetings with herself at least every month and said I should do the same. You can do a lot of things during your retreat like going outdoors, meditating, reflecting, and writing. You can do this through your organization and/or collective. The most important thing is setting your intentions to actually create space in your life to make this a practice. Of course, some of this is easier said than done. In fact, it is hard sometimes to make time for this. But we also have agency and can make choices. Even if you did this once a year, it will have a tremendous impact on your life and others. In particular, I encourage more cisgendered, hetero men, and men of color to dive deeper into this practice. Patriarchy and heterosexism also runs deep in the movement so we really need to make time for self-reflection and take care of our needs for ourselves and the movement. Overall, I hope this blog can help catalyze more conversations, more practices, and, yes, more meetings. Finally, I want to acknowledge that there is a lot going on, and, like many of you, I’ve been totally inspired by the current moment and the new vibrant ‪#‎BlackLivesMatter and Black liberation movement that’s emerging in this country and world. I hope everyone gets a chance to soak it in, reflect, and replenish for yourself, your community and the movement. For our fierceness, courage, and collective liberation, we need to do this. I, too, will commit to do my best and will be my best self for the moment and beyond. Happy 2015 and happy year of reflection and resistance! Alex T. Tom is the Executive Director of the Chinese Progressive Association in San Francisco, the co-founder of Seeding Change – a Center for Asian American Movement Building, and a new father.